I recently purchased a NOS (New Old Stock) watch cuff that had never had a timepiece in it. I wanted a good timepiece for it, one that would put up with my rugged lifestyle and look good with my fall and winter flannel shirt ensembles….but without breaking the bank. I had researched the Citizen Eco-Drive stainless steel watches and some self winders but all I saw were out of my price range. I looked at manual wind up watches and purchased a Timex that was advertised as having a stainless steel bezel only to find on arrival that it was brass with chrome plating !! So I returned it and put the poor empty cuff on my desk and looked at it for days, weeks……….months……….and then something appeared…………..
An estate lot came in with a number of men’s watches in it. One of the vintage cuffs had a stainless steel Wenger in it and while it looked super cool on that cuff, it was really not functional because you could not grab onto the stem which was flush with the edge of the cuff. 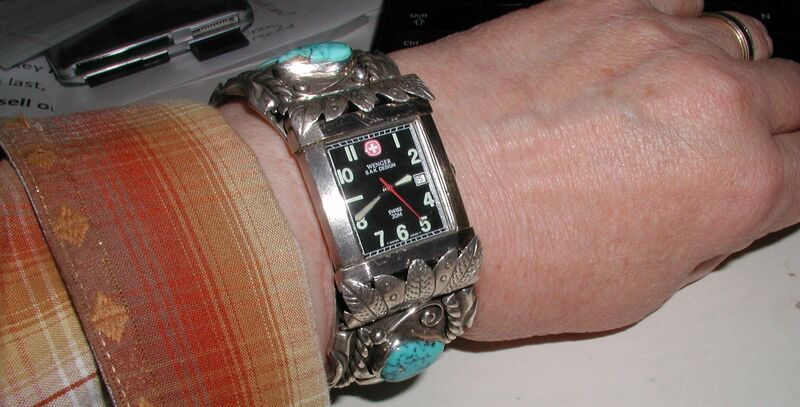 The timepiece was really too narrow for that vintage cuff with straight sides. So with the store’s blessings, I pulled a switcheroo. From the left, my NOS watch cuff, the vintage cuff with the Wenger watch, a black quartz watch. The Wenger went into my cuff and because the cuff was sculpted inward on each side specifically to allow access to the watch stem, it was a perfect marriage. Fits like a glove and easy to read. A black blanket-pattern quartz watch, that was wide enough so that the stem extended over the straight edge of the vintage watch cuff, was installed and now that cuff has a functional watch. Thank you to Henry and Diane for their excellent help with custom repairs and modifications.